Sony is breaking with tradition tonight and unveiling its next PlayStation video game console well ahead of the E3 video game conference in June.We’re not expecting to get much info about the so-called PlayStation 4 beyond basic specs, content partnerships, and a few demos of next-generation games. According to The Wall Street Journal, the PlayStation 4 will let you stream games over the Internet, meaning you won’t need to use a disc. The streaming feature will likely be used for older PlayStation games at first. Most games will still run on a regular disc. The WSJ also reports that Sony considered letting all users download games online, but the games were too large and there was a concern many users wouldn’t have a speedy Internet connection. Last week, a photo of an early PlayStation 4 prototype controller leaked. 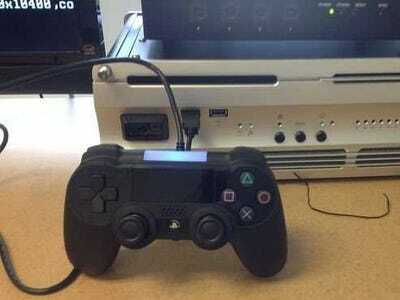 The controller looked very similar to the PlayStation 3 controller, but it had a touchpad on the front. Many are expecting Sony to focus on media partnerships with the PlayStation 4. That means playing up streaming services like Netflix, Hulu, and Sony’s own Crackle plus letting users download or rent other video content. Sony also expected to make some sort of social gaming announcement, so don’t be surprised if the company announces Facebook or Twitter integration. As we’re several months away from the PlayStation 4 launch, it’s highly unlikely Sony will give us precise pricing. The Wall Street Journal reports the PlayStation 4 will go on sale in time for this year’s holiday season. Sony’s PlayStation announcement starts today at 6 p.m. Eastern. You can follow our live coverage here.